These are from a new find of quartz in Messina, South Africa. The famous copper mines there have been closed down for some time and all of the original quartz mined was becoming rare. New finds opened up, only to have closed within a year but the quartz from them is nothing short of amazing! This oddly-shaped yet wonderfully milky-misty crystalline cluster is 4.6 oz and 2.4” by 2.3” by 2.1” and is oddly arranged with healed crystals and contact areas – as if she developed between two other large crystals. Drusy quartz in the crevices is mauve hematite-stained and she has elestial areas, drusy areas, regular crystals, thin tabby crystals and even some crystal caves. You won’t tire of exploring her with a loupe! These are sacred, sacred crystals, the Jewels of Lemuria … and ready for her special Keeper! The energies from this cluster are so incredible for enhancing personal power (in a positive way), while also allowing Spiritual growth and development. This is a magical, magical combination … the balance is sublime and set in this already Spiritual host quartz from Messina, well … it is beyond sublime! This is a wonderful Spirit for those trying to assimilate the vast array of sensitivities and energies they are experiencing, freeing up the physical expression and putting the energy movement where it belongs … in addition, there is a new Lemurian awakening in this time and some feel that this year of 2012 has ushered in the New Age of Lemuria. 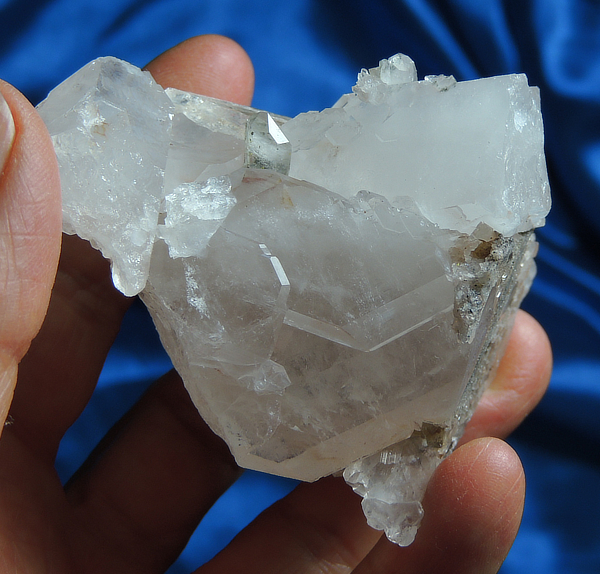 New Lemurian crystals are appearing from every corner of the world and from areas traditionally not thought to spawn Lemurian crystals. When I got the channeling for the Blue Tara Lemurians, I was told that the Lemurians knew of the pending destruction of their island and then encourage their people to spread to all points on Earth, together with the ‘Lemurian seed’ crystals so that at the proper time, the knowledge could be awakened. As I opened these special crystals, the hair was literally standing on the back of my neck … it was an experience I’ll never forget as I felt I was entrusted with the most sacred crystal ever to see the sun’s first light. I sobbed, I processed, I admired, I savored each one and know that one by one, they will go to a special Keeper who will be part of the Lemurian Awakening. This is an important Spirit for one who would be among the valiant and stalwart Keepers of these Jewels of Lemuria!